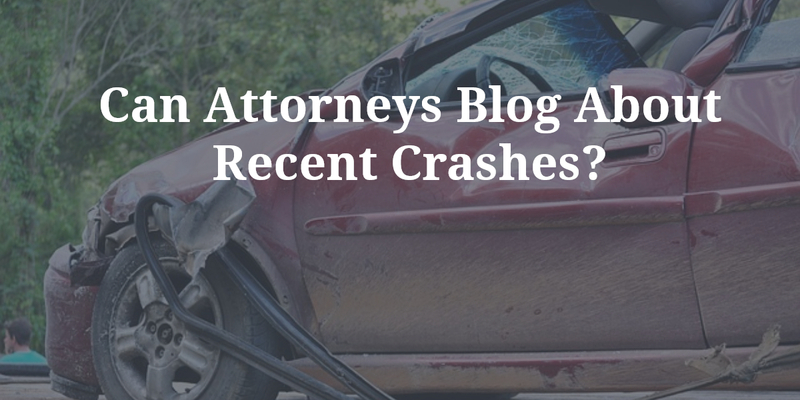 Home → Content Creation → Car Accident Content – Can Attorneys Blog About Recent Crashes? Every state has its own rules that govern how attorneys should conduct themselves. Those rules set limits on what a lawyer might or might not do in the context of soliciting clients. Solicitation isn’t an ad on the side of a city bus or a billboard on the road to the courthouse. Solicitation involves purposefully approaching a potential client and proposing an attorney and client relationship that operates to the benefit of the attorney. Ads on the sides of buses and billboards aren’t targeted communications that are directed to a specific person that can be reasonably understood to be offering legal services. They’re intended to be for the benefit of the general public, and there’s no potential for in-person abuse. They’re not specifically targeted at Mr. John Q. Public who was injured in a crash with a drunk driver on Interstate 90 in Raleigh on December 23, 2016. When does the potential for abuse arise? Direct contact by telephone or by real-time electronic means with John Q. Public within a relatively short time after he got hit by that drunk driver indeed raises the potential for abuse. He might be hospitalized or at home in considerable pain while recovering and feeling emotionally, physically and financially overwhelmed about the disaster that he encountered. John Q. Public could be stuck with a persistent lawyer who is stripping him of his ability to evaluate all of his options with sound judgment and the best interests of himself and his family in mind. The circumstances are a recipe for abuse, undue influence and not so friendly persuasion. That’s what justifies prohibition of telephonic or real-time electronic communications by a lawyer and an unknown individual within a relatively short time after that individual’s need for a lawyer arises. The fact that John Q. Public got hit and injured by a drunk driver on Interstate 90 in Raleigh two days before Christmas is indeed newsworthy, and reporting or blogging about it a few days later can operate to inform the general public about the need for legal services and competent personal injury lawyers. What distinguishes blogging about the occurrence from telephonic or real-time electronic means is that John Q. Public isn’t directly targeted and contacted through the blog entry. In the unlikely event that he reads about the accident, it was also reported in The News & Observer four days earlier, and there was no direct real-time contact by the personal injury lawyer blogger. Whether it’s permissible for an attorney to blog about a recent car accident is all about the targeted audience. If the attorney blogs about a recent accident, and he or she emails a copy of it to the victim, there’s likely a problem. If the blog entry is for the informational benefit of the general public, and the victim stumbles across the blog entry, he or she wasn’t directly targeted. The subject matter of the entry was newsworthy and informational. It’s highly likely that the blog entry isn’t in violation of the rules prohibiting attorney solicitation. If you liked this, see our related article about the ABA and content solicitation.